Trolley Wayfinder Birds Eye View of Trolley Routes in New England. 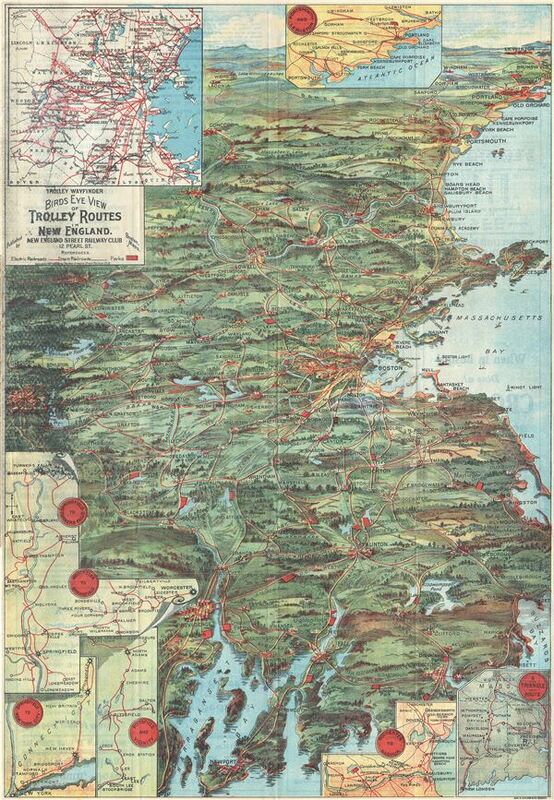 A scarce and stunning bird's eye view style pocket map of New England issued in 1905 by George Walker published by the New England Street Railway Club. Reveals New England centered on Boston. The view extends north as far as Lewistown, Brunswick and Yarmouth; south to Narragansett Bay, Newport and New Bedford; and west as far as Worcester. Shows train and trolley routes throughout the region. It also notes various parks, light houses, historic sites, geographical features, and cities throughout. Popular routes are highlighted with inset maps, these include: Springfield-Turners Falls, Worcester-Springfield, Springfield-New York City, Pittsfield and Vicinity, Rochester-Nashua, Portsmouth-Lewiston, and a triangle route from Worchester to Providence to New London and back. An overview of the Boston area appears in the upper left corner. Overall, a charming example showing the extent of the trolley service during the early twentieth century. Verso includes several advertisements. This map was created by Geo H. Walker and copyrighted 1904 and 1905 and was published by the New England Street Railway Club. Walker is better known for his similar view maps of Boston Harbor - the present example is thus somewhat out of his focus area and very scarce. New England Street Railway Club (July, 1900 - c. 1925) was a technical and engineering organization based in Boston during the late 19th and early 20th centuries. The organization was founded by Robert H. Derrah (1865 - 1920) in July of 1900. Derrah subsequently worked as the club's secretary and published its bulletin. The club was a popular and politically potent organization at a time when rail and trolley transit was common throughout New England. They held annual dinners that attracted high society from throughout the region. President Taft is recorded as speaking at one such gathering. The society issued numerous tourist oriented publications related to rail travel in New England. Very good. Minor wear along original fold lines. Minor print stains near title and cover. Folds into original binder.